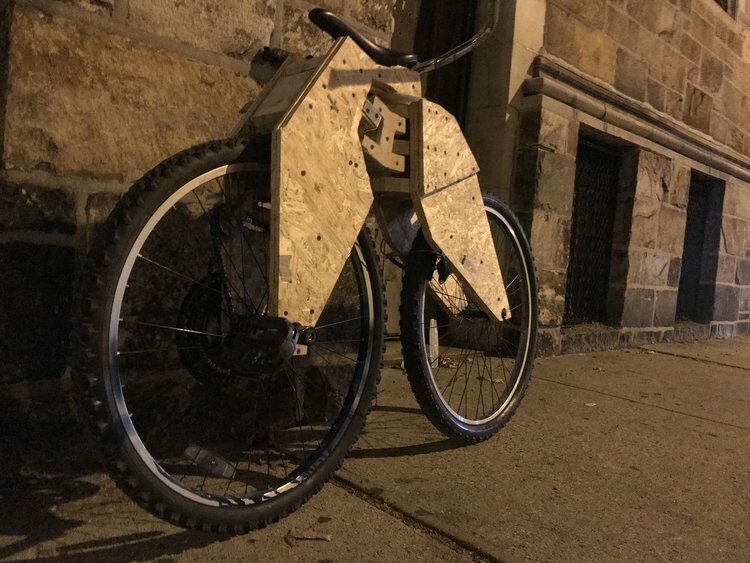 I have always wanted to build a wooden bike. But I am not really interested in the bamboo bikes or higher end models which use epoxy and composites to join the tubing/spars. I wanted something that was cheap. One great thing about NYC is there are a lot of people throwing things away. 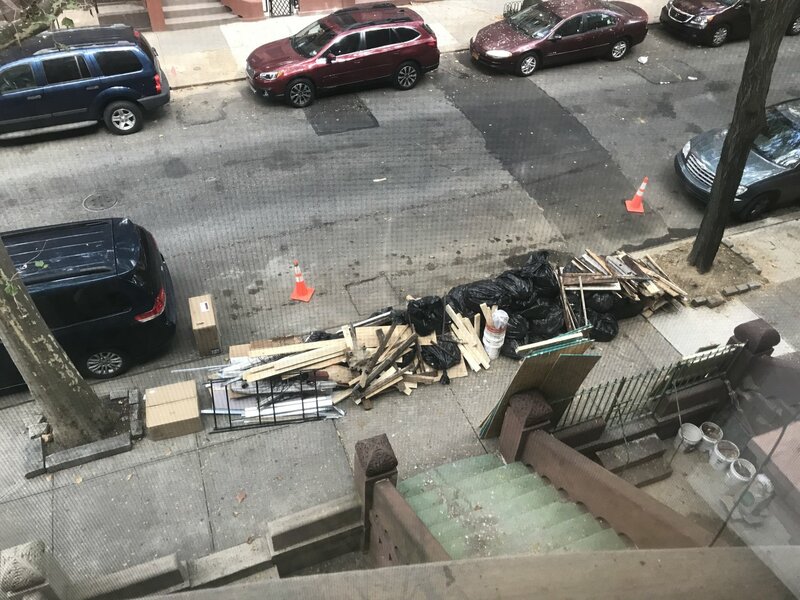 There is always a stack of wood in a dumpster nearby and routinely half mutilated bicycles are in the garbage also. Wood for the taking. 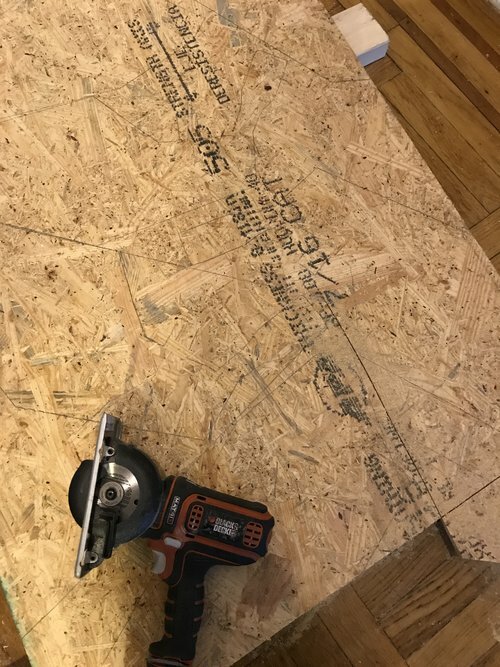 I used the Oriented Strand Board (OSB) leaning up against the building and some of the 2x4’s. I found this jewel in the trash a few months ago. Missing quite a few things but good enough. 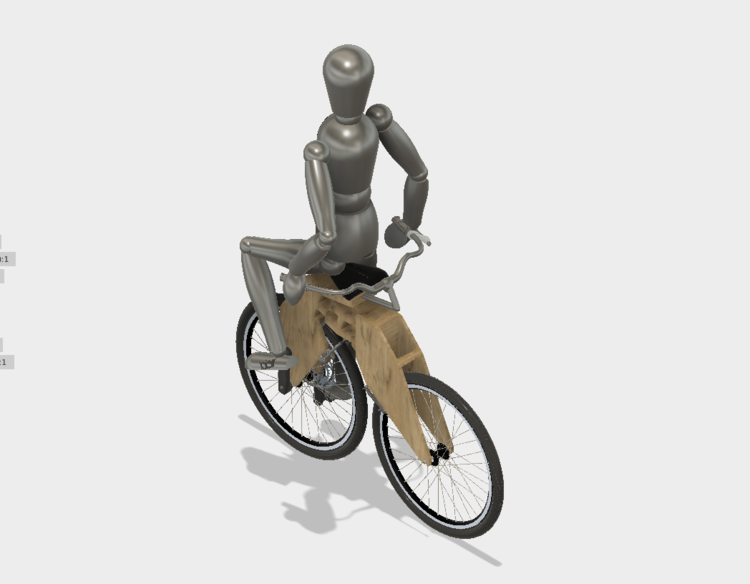 The design is similarish to the aluminum bellcycle bikes. 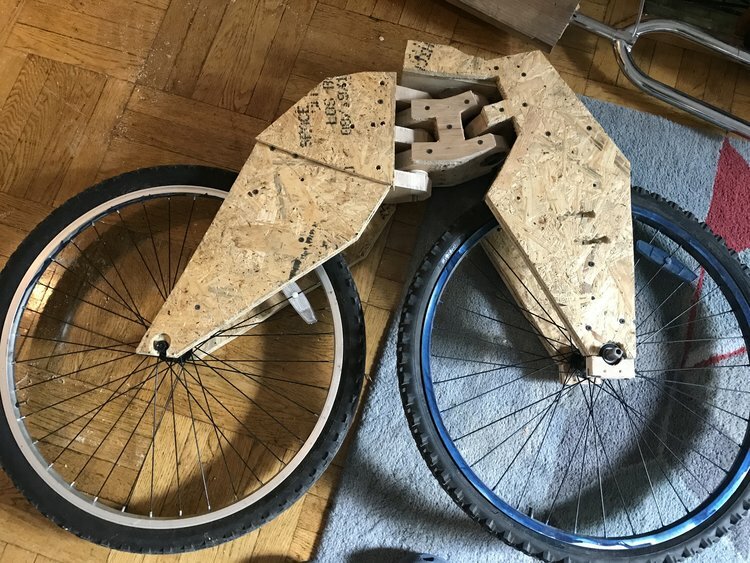 It has the front frame which holds the same kind of front drive wheel. 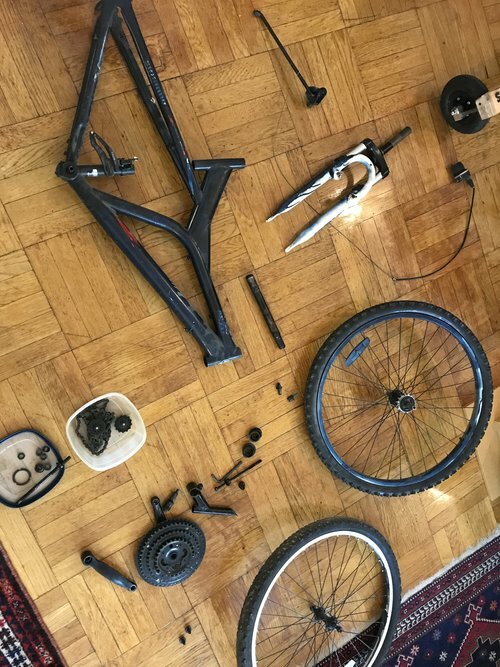 The center frame connects to front frame through a headset bearing and has the spring to remove pedal interference. The rear frame freely pivots behind the center frame. 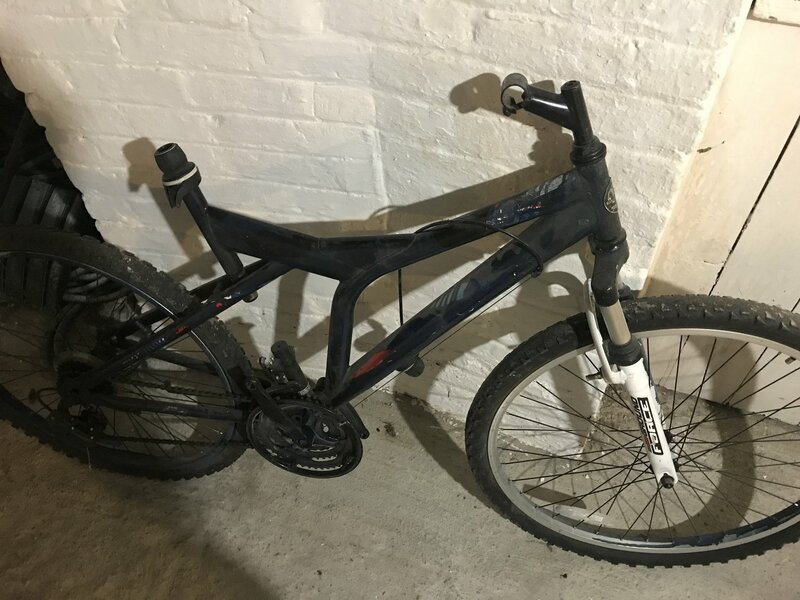 Both wheels, tubes, tires etc. The top threaded tube from the fork. 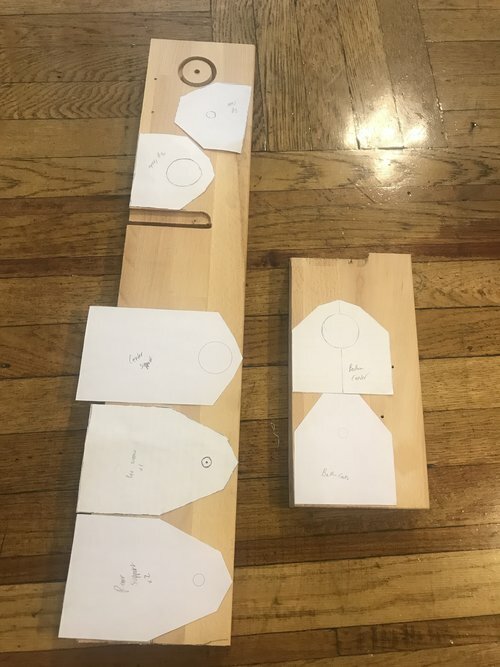 I printed out the shapes of the center frame pieces and laid them out on scrap pieces of wood. Cut them out. 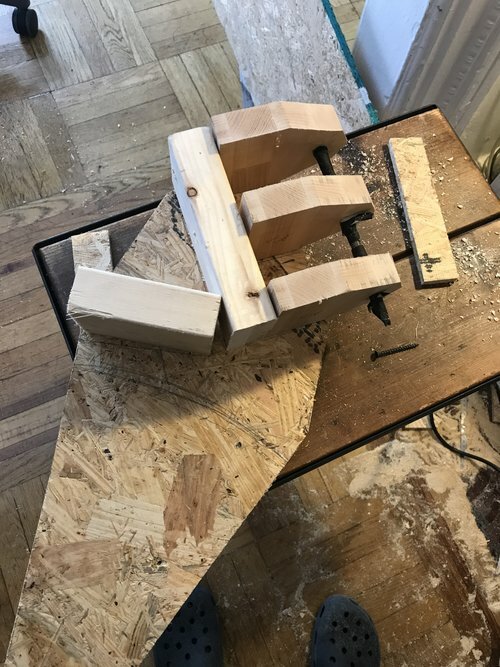 Made some poor joinery and glued the whole section together. 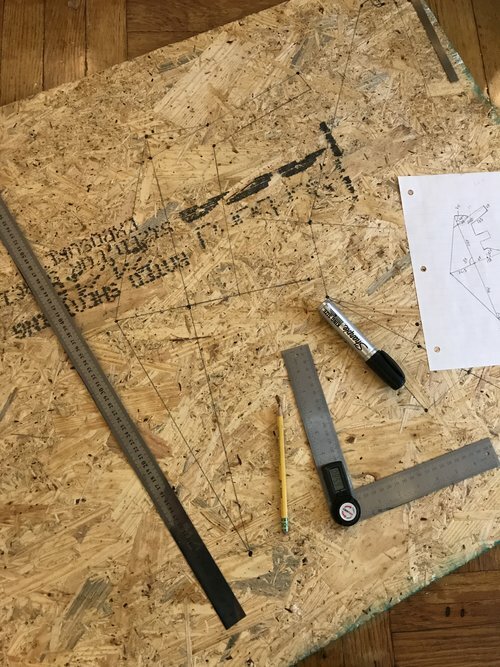 I laid out the dimensions of the rear and front frame on the OSB. 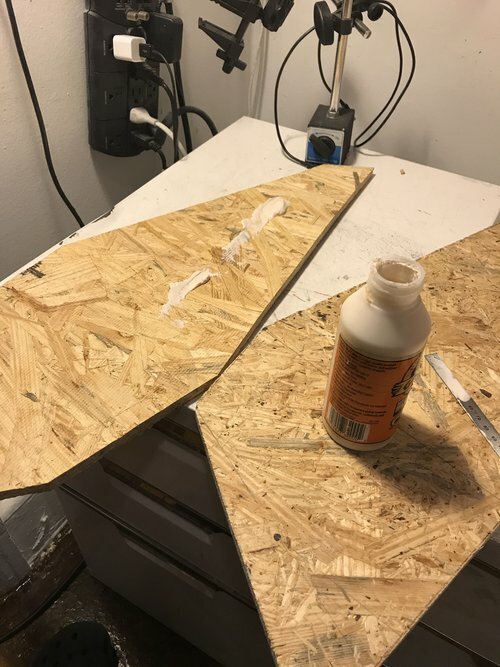 The OSB was .5 inch and I ended up doubling the width. 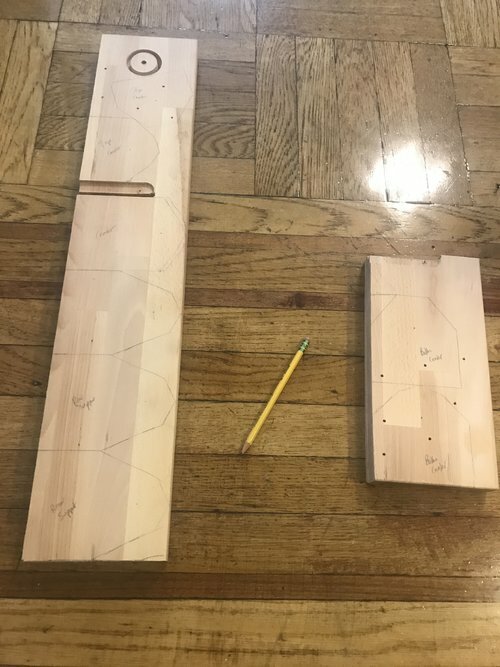 I cut out and glued together the pieces. I assembled all the pieces. I used a lot of drywall screws in lieu of glue which I ran out of. 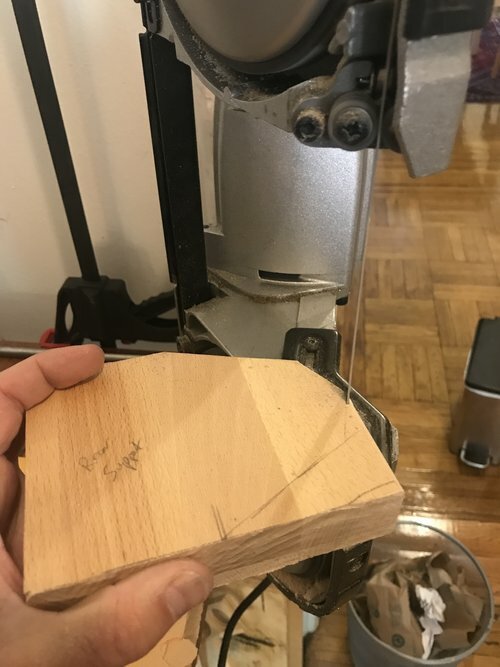 The wooden bearing caps kept on pulling out of the plywood. I will have to replace them with steel caps and potentially glue the screws in place. The steel headset gradually deforms the wood and sinks in. 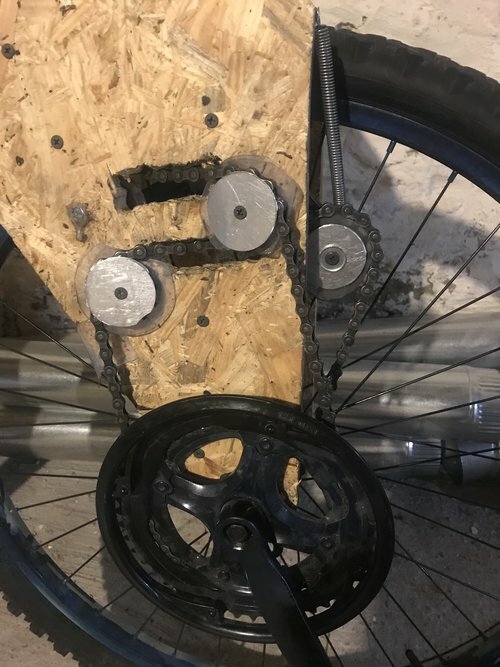 This causes the connection to be loosened and the whole bike to sag. I.e. the center of the frame starts moving down relative to the front and rear. 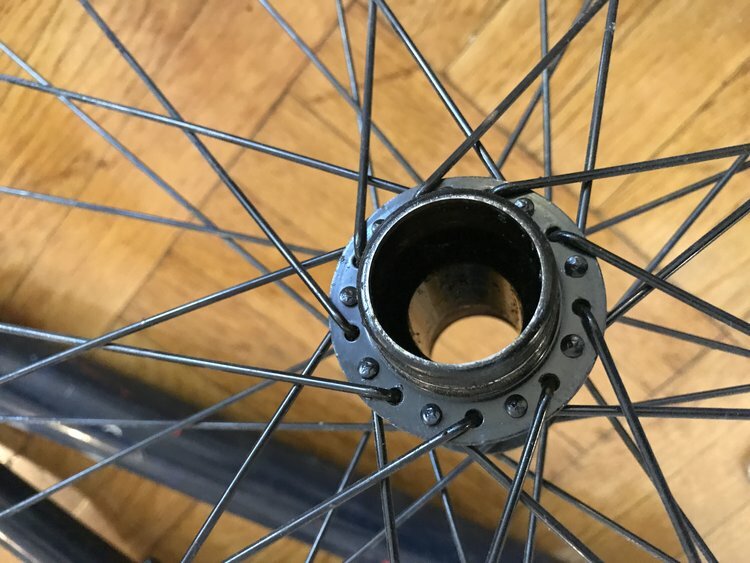 This causes the handlebar connection to rub on the top of the center frame which is not great for steering. 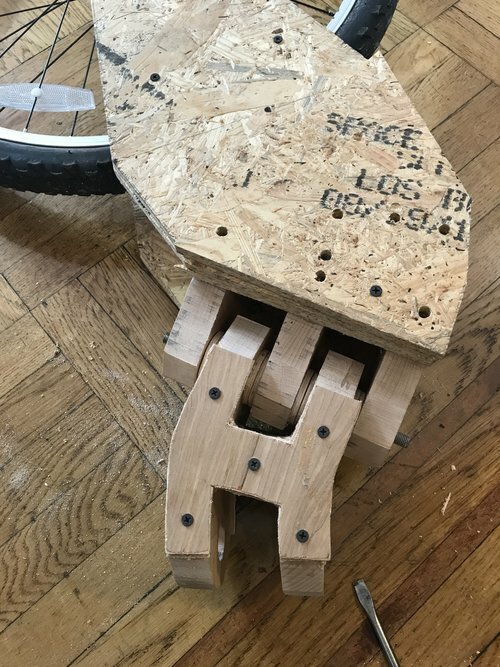 The cutouts for the chain are not quite large enough so the chain rubes on the plywood making noise and increasing pedal effort. It looks great in person.